>> Chop Saw vs Miter Saw – What’s the Difference? ​Selecting the right saw is not always easy. There are dozens of options and some saws look very similar, including the chop saw and miter saw. ​If you are currently trying to select a saw, take the time to compare these two choices. Discover the differences, advantages, and disadvantages of using a chop saw versus a miter saw. ​Chop saws and miter saws have a lot in common. They both use large, circular blades. They also cut material from the top using a downward motion controlled by your hand. ​There are two primary differences between a chop saw and a miter saw. First, the typical chop saw is larger than the average miter saw and more powerful. While the typical miter saw circular blade is 10 to 12 inches in size, most blades for chop saws start at 14 inches. ​The other major difference is that a miter saw can be rotated to create angled cuts. The chop saw only cuts straight, 90-degree cuts. The angled or mitered cuts allowed with a miter saw are useful for cutting molding. The smaller blade also allows for more detailed work, which is necessary when working with smaller materials such as trim, molding, or framing. ​These differences make a miter saw more versatile than a chop saw and thus suitable for a wider range of applications. For most home improvement projects, the typical craftsman is more likely to need a miter saw than a chop saw. In fact, if you have a miter saw, there is little reason to purchase a chop saw. However, there are several benefits to using a chop saw. ​When Should You Use a Chop Saw? ​As mentioned, chop saws tend to have larger blades and more power. These features make them suitable for use in commercial or industrial settings. A chop saw may also be used to cut through a variety of materials. Due to the power of the chop saw, it is also often used in commercial settings when a large volume of material needs straight cuts. ​Miter saws are available with a variety of features that can make certain jobs easier. One feature that is found on most miter saws is a laser guide. This laser projects a laser beam to show you the exact spot where the cut will be made. The laser guide improves accuracy. While this is a useful feature, it is not a necessity. 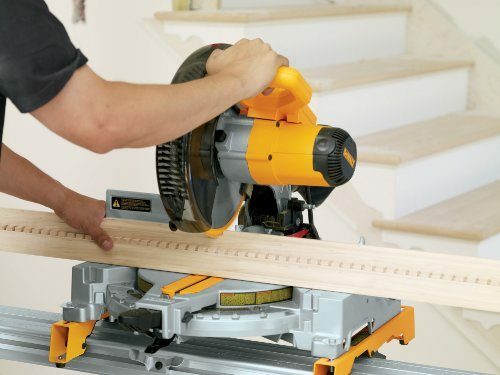 ​Miter saws are also available with stops for added convenience. There are depth stops and positive stops for cutting set angles. With the depth stops, you can limit the depth of your cut to the same depth every time. With the positive stops, the miter saw can quickly be set to cut at a 45-degree angle, which is useful when making repeated cuts at the same angle. ​Other features that you may look for include extension arms and a dust collector. The extension arms are recommended when you do not have a table for support. The arms also offer support when working with longer pieces of wood. The dust collector helps collect dust instead of allowing it to get everywhere. You also need to determine which type of blade to get for your miter saw. While most miter saws use 10 or 12-inch blades, there are various types of blades with varying blade teeth. ​The three most commonly used types of blades include carbide-tipped blades, steel blades, and high-speed steel blades. The carbide-tipped blades are often used for detailed woodworking, as they produce smooth cuts and last longer. The steel blades are the most affordable and are used for cutting softer woods. ​When looking at the blade teeth, the number of teeth often determines the accuracy of the cut. With more teeth, the blade can produce finer, smoother cuts. ​When shopping for a chop saw, you should pay attention to the type of blade, the motor, and the safety features. There are two main types of blades that are commonly used for chop saws – abrasive blades and cold saw blades. Abrasive blades tend to leave materials hot, as they produce plenty of sparks. The cold saw blades are more durable and do not produce as many sparks. They also cut at slower speeds, helping to create smoother cuts. ​The motor is also an important consideration. You should look at both the horsepower and amps of the motor. The general recommendation is to find a chop saw with a 15-amp or higher motor. The most horsepower you will find is a 4-horsepower motor. ​While a more powerful motor will help maintain productivity when used in a commercial setting, you should also look for motors that operate at low speeds. With lower speeds, the blade produces fewer sparks and finer cuts. ​There are also certain safety features that you may want in a chop saw. For example, spark deflectors are useful for deflecting sparks away from the saw and the person operating it. Other safety features include blade guards and eye protection plates. ​here are dozens of saws and each serves a general function. Choosing the right saw depends on the type of cutting you need to do. The typical recommendation for home renovations and hobby woodworking is to get a miter saw. You can still perform the straight cuts that are possible with a chop saw. However, you also have the option of cutting at an angle. Chop saws are mostly recommended for heavy-duty use, such as in a commercial or industrial setting. For example, if your shop or factory requires high-volume cutting that involves a lot of straight cuts, the chop saw is often the preferred choice. Chop saws are also suitable for cutting a variety of materials, including metal. In the end, the saw that you select will also depend on your personal preferences. Just remember that a miter saw can perform miter cuts, while a chop saw is limited to straight cuts.